All the useful information that you need to know before sending money with Venstar Exchange! Founded in the year 1990, Venstar Exchange offers exchange services to individuals and businesses. The company handles the transfer of funds above $10,000, which is its minimum transfer value with no maximum limit. It is rated A+ by BBB which offer premium transfer services to private clients, small firms as well as large corporations. The company offers various services including bank transfers, wire transfers, spot contracts and forward contracts to transfer funds internationally. The company does not provide 24*7 customer support but can send an email or fill the form to get a call back soon. It is a highly secured website so, one can transfer the funds without any worry. Pricing : How much does Venstar Exchange cost? The transfer fee is nil if you transact above $10,000. But if you transfer less than $10,000 you have to pay $15 per beneficiary for the convenience. If you perform spot or forward contracts, you have to pay 10% of the total amount as a fee. The exchange rates of Venstar Exchange are, on average, 6 to 8% better than banks. This gives the customers better options to send funds at better rates internationally. 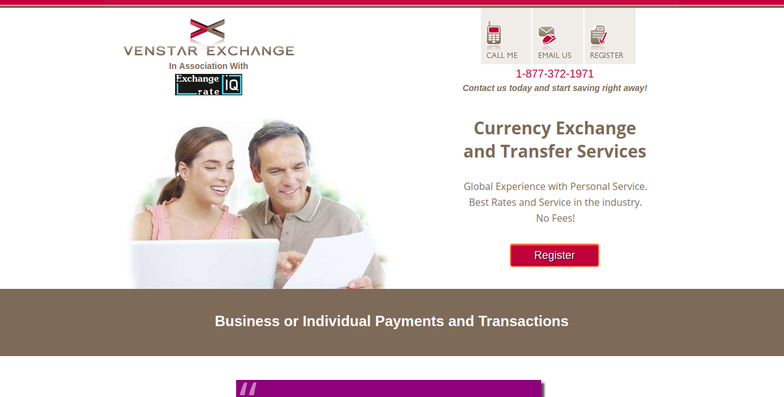 On the pricing basis, experts of Exchange Rate IQ provide 8 out of 10 to the Venstar Exchange. Transparency: Does Venstar Exchange have any hidden fees? There is no hidden fee charged by Venstar Exchange. The recipients will receive the same amount as shown on the transaction page. The company provides transaction receipt through email to the sender which will provide the details of currency conversion. Besides this, the customer service authority will also inform you regarding funds received, converted and transferred to the beneficiary account. The company has an excellent tracking procedure as well as no hidden fee. Through it is not offering online tracking procedure like other competitors, so we rate it 9 out of 10 in transparency head. Transfer Speed: How long does it take to send money through Venstar Exchange? The transfers from Venstar Exchange take 1 day when you are transferring to the countries including Canada, USA, Australia, New Zealand, and any other country of Europe. While in other countries, it takes up to 3-5 working days to reach the money to the recipient. There is no fast transfer service available, so, if you have to transfer in an emergency, you cannot transfer instantly and at the same time, it does not offer online sign up and login process on its website. This transfer speed also depends on the country and currency of the recipient. So, on its transfer speed, we rate Venstar Exchange 7 out of 10. Security : Is Venstar Exchange Safe? One is always open to online fraud, property damage and theft if there is no online defence system available. But, Venstar Exchange is committed to taking the security very seriously and to provide the best services by protecting the information through multiple layers, physically and electronically. Its multiple layers of intrusion detection systems both, software and people running 24×7 monitoring as well as information is protected by SSL with 128-bit encryption. Astaro-based devices employ state-of-the-art unified threat management technology, which immediately notifies any abnormal activity. Company’s databases are encrypted physically, and all drives and tapes are encrypted with different keys. One can do the transactions worry-free with Venstar Exchange and therefore, we rate its security 10 out of 10. Talk with an advisor regarding any query. The company offers various rewards to its clients depending on the transactions performed by them with them. The company does not have any mobile app, so one has to perform the transaction through the website only. So, for transacting with Venstar Exchange register here. On the user experience basis, Venstar Exchange deserves 7 out of 10 as it has no direct transfer page, no tracking page as well as no mobile apps. So, there are many areas where the company has to work to provide the best services in the money remittance industry. Coverage: How many Countries & Currencies does Venstar Exchange support? The company has yet many countries to cover to become a top money exchange service provider. So, we rate it 7 out of 10 for its coverage. Go to the website of Venstar Exchange. Click on the type of transfer you want to perform from various transfers provided on the home page. Here you will be redirected to a new page, where you will see the online form. Fill the form and the customer support will provide you with a form to fill through email on your registered ID. Fill the form, submit the ID proofs. You will be entitled to perform the transfer by booking it through your designated Venstar Account Specialist.